St. Petersburg has a huge network of rails set in its roadways and electric wires running overhead to serve electric trams and, although trams may be progressively playing a lesser role in urban transport and lines are being shifted to outlying city districts, they still remain visible on city center streets. This autumn, as the city celebrates 100 years of its electric tram service, a refurbished tram museum is being opened in the Vasilievsky Ostrov depot. Inside this historic building, “mobile” and “stationary” exhibits tell the story of trams and other means of public transport. St. Petersburg tram lovers began collecting and restoring historic trams about ten years ago. Now the museum has 20 “retro” trams in fully serviceable condition, as well as recently added retro-buses and trolley buses. 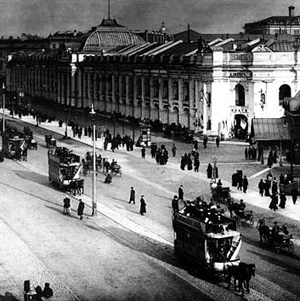 St. Petersburg was not the first Russian city to have a tram line. In Kiev, part of the Russian Empire at the time, a tram service was introduced in 1892. However, taking into account the length of the rail lines, number of cars and amount of staff working in city tram depots, it was the imperial capital of St. Petersburg that earned the name of “tram capital of the world” among afficionados. St. Petersburg’s first electric tram route connected Nevsky Prospekt with Pokrovskaya (now Turgeneva) Ploshchad and opened on Oct. 26, 1907. This was an important event not only because a new comfortable and cheap means of transport was being introduced but also because it signified the victory of municipal authorities over monopolist private owners of omnibuses and railways. This came a year after the opening of a provisional tram service laid down on ice for winter transport between the city’s islands had attracted great public support. By 1912 the length of tram rails in the city had reached 119 km, with 14 different routes embracing major avenues, squares, railway stations and hospitals. Trams delivered passengers from one island to the another, from Novaya Derevniya to Okhta and even as far as Strelna. The two main city depots engaged 6,000 employees, including conductors, electricians and mechanics. The first people hired for driver’s positions had been city coachmen. The service started daily at 7.30 a.m. and stopped at 11 p.m. The coaches were divided into first and second class compartments and carried a maximum of 34 passengers. The regulations of the day barred admittance to passengers who wore dirty clothes, were drunk or displayed unruly behavior. During the first 50 years of its existence, the tram network grew rapidly but the opening of the metro in 1955 challenged its dominance. Nonetheless, expansion of the tram lines continued through the second half of the 20th century as they reached out into new residential districts. What finally changed the outlook for trams has been the dramatic increase in the number of cars on the streets of St. Petersburg over the past few years. The “mobile” part of the tram museum brings its exhibits to the public. Several times a year the retro-trams leave the depot on Vasilievsky Ostrov and travel around the city. One of those special dates is April 15. This commemorates the day in 1942 during the Siege of Leningrad when the city trams began running again following a break from the first days of the blockade in December 1941. “Memorial” route No. 0 travels along Sadovaya, Nevsky and Turgeneva Ploshchad. The museum also rents out its retro-trams for special events such as birthdays, graduation balls, and corporate events. Among the services on offer are table service with waiters, live music and the possibility of getting on and off at any point. The “stationary” part of the museum’s collection includes historic photographs, archival documents, the uniforms of tram drivers and conductors, historic ticket machines and models of horse-drawn trams which were predecessors of electric trams, such as the bright blue example in front of the Vasileostrovskaya metro station. City news archive for 14 September' 2007. City news archive for September' 2007.